From humble beginnings sketching Iowa’s cornfields and rolling hills as a child, painter Grant Wood (1891–1942) became the father of Regionalism—an artistic movement that celebrated the real-life surroundings of the people. While studying art in Europe in the early twentieth century, Grant couldn’t find a style that touched his heart quite right. Impressionism, Cubism, and Abstract art didn’t reflect his view of the world. It wasn’t until he stumbled upon Gothic art that Grant recognized something familiar. Back home in America, Grant asked his sister and his dentist to pose for what would become a uniquely American work of art and the founding iconic image of Regionalism. Grant’s art celebrated hardworking Americans who finally saw themselves depicted in fine art. 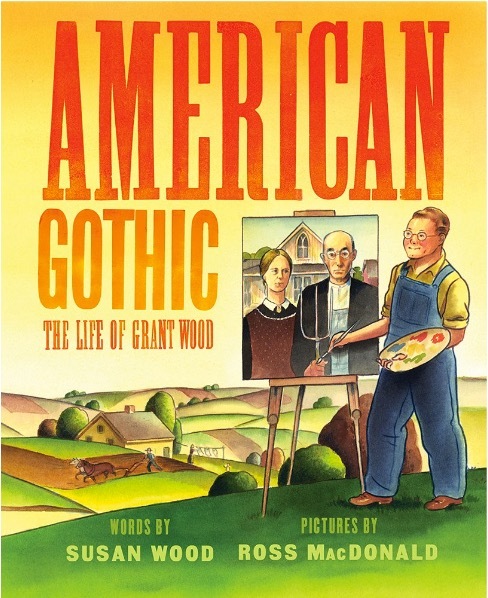 American Gothic is a picture-book biography that explores the birth of the famous painting, the movement that made it possible, and the artist who created it all.